Faith Once You Have It Nothing Can Shake You, Quake It And Only God’s Force Can Take You! The last day of Kwanzaa honors the principle that must be the foundation or the rock that runs within each one of us. It binds us against the harsh winds of life that sometimes will place obstacles in our path of individual and community growth. Just as David faced his demons with the faith that somehow, someway his God would shield him from his enemies. David faced insurmountable odds, yet he had a faith level that was as high as the skies above him. 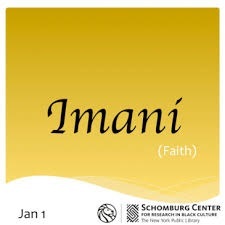 That is what Imani(Faith) is all about it is the resolute desire that when all the odds are seemingly against you. All one has to do is search within themselves and reach for power that ascertains each of our abilities to rise above all our circumstances and defeat the challenges that confront us. I truly believe that “our” fought against incredible odds that included bigotry, hatred, oppression, repression, depression, regression, violent evil intentions, and unheard of inhumane actions; yet they had within them the capacity to stand the storm and evil winds of a society hellbent on their destruction to not break from the bounds of faith. That faith held each of them together who had it and lessened the pain when events took away from them loved ones lost in the struggle for human, civil, judicial and social rights. So as we look around our blighted communities on this first day of 2018. We all must search for our own degree of FAITH and we must assist those in finding their level of faith. No matter how minuscule that level maybe it can be elevated, heightened and magnified to shine brightly within us. That is why the seventh day focuses on FAITH because it is FAITH that will move that mustard seed of doubt and belief in self to a gigantic mountain of believing in hopefulness that nothing can stop our eventual progression towards the greatness that is due us. There will continue to be rocky roads or obstacles but belief in unity, self-determined effort, collective work and responsibility, cooperative economics, unyielding purpose, creative thought, and action, tied to the faith in ourselves and others will secure the desired results. We will indeed overcome and the day will come when all of God’s children will seek love, not hate and truly build the community of man. That was I feel the original purpose of Kwanzaa it was meant to build a humane driven society. Let’s all reach for those principles each and every day we live. However stay around those you believe YOU are becoming an ACE. That dream YOU hold is not infirmed it is gonna go and be met long-term. You have just been REAFFIRMED and CONFIRMED. I really hope that these seven days have brought a smile and snicker. I hardly drank any liquor and I damn sure didn’t want anyone to bicker. You see COMMUNITY BUILDING is the kicker. The fact of the matter is I believe it will also prolong your internal ticker you certainly won’t be close to being mentally or socially sicker. Let’s make this year the year that black bodies are left standing and humanity and love of each other are all that we are demanding. So have a great remainder of the week and I do hope you enjoyed my week of celebrating my historical interpretation of Kwanzaa during its 51st anniversary.